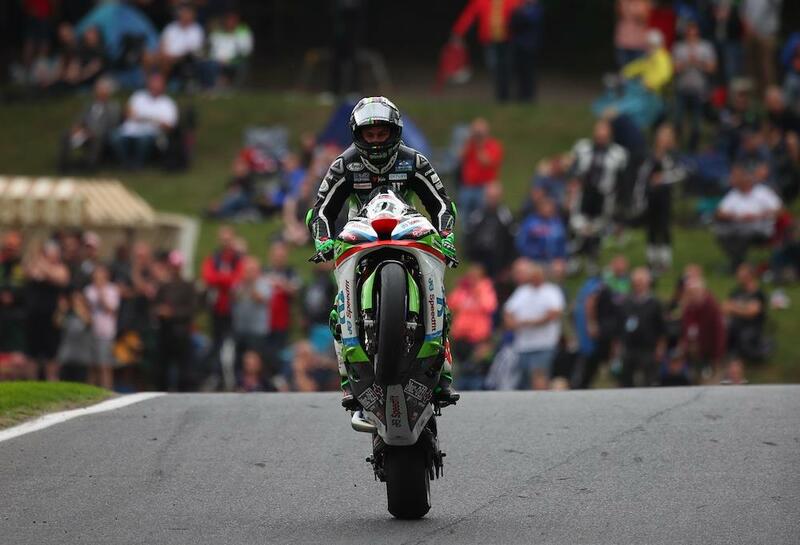 Leon Haslam extended his championship lead with a commanding double victory at Cadwell Park today. The JG Speedfit Kawasaki rider got the better of fellow Kawasaki rider Jake Dixon in the afternoon’s second race to take his ninth win of the season. Young gun Bradley Ray took the holeshot and led the opening laps with Haslam slotting into second ahead of Dixon and Glenn Irwin. After a bad start, Tommy Bridewell was on the move through the pack when he crashed out on the MotoRapido Ducati at Barn on lap six. The Buildbase Suzuki rider continued to lead as the second half of the race began with the leading trio of Ray, Haslam and Dixon gapping the rest of the pack. Haslam would pull a carbon copy move on Ray to the one he had in the first race, sliding past at Park. Having seen Haslam pull ahead, Dixon also took his chance to move into second at the Gooseneck on the same lap. The two Kawasakis immediately gapped Ray and looked set to duel it out until the end. Dixon took the lead with three laps to go, but Haslam was back in front on the penultimate lap and some defensive riding from the series leader saw Dixon forced to run on at the end of the Park straight, handing second place back to Ray. Dixon’s mistake left Haslam to cross the line five seconds ahead of Ray with Dixon recovering to take third. Peter Hickman took a strong fourth place to move into the championship top six. Glenn Irwin crossed the line fifth as he continued to struggle from the shoulder injury he sustained in free practice with Tyco BMW’s Christian Iddon completing the top six. Michael Laverty finished seventh ahead of Danny Buchan, who endured a tough day after a crash in the opening race with Richard Cooper and Luke Mossey rounding out the top ten. Josh Brookes’ tough weekend continued as he was forced to retire from a top six finish with an engine issue. Haslam’s victory sees him extend his series lead to 100 points and 31 podium credits, while at the bottom end of the top six Hickman moves ahead of Buchan by seven points.